إن فندق كيرنز هاربر لايتس بموقعه الممتاز في كارينس سيتى سنتر هو نقطة انطلاق جيدة لنزهاتك في كيرنز. يجذب هذا الفندق ذو 4.5 نجوم، والذي يبعد 1 km فقط عن وسط المدينة و 8 km عن المطار، الكثير من الزوار سنوياً. كما يمكن الوصول بسهولة إلى Underart Gallery, Casino, Doongal aboriginal art. يعرف Accor Hotels بالمستوى الراقي لخدماته ولباقة موظفيه، وهذا ما ستجده في كيرنز هاربر لايتس. إن مكتب الاستقبال على مدار الساعة, مرافق مخصصة لذوي الاحتياجات الخاصة, تسجيل وصول/خروج سريع, تخزين الأمتعة, واي فاي في المناطق العامة هي جزء فقط من الخدمات التي تميز كيرنز هاربر لايتس عن باقي الفنادق في المدينة. بالإضافة لهذا,تتضمن كل غرف الضيوف مجموعة واسعة من وسائل الراحة . بعض الغرف توفر حتى تلفزيون بشاشة مسطحة, مرآة, صوفا, مناشف, اتصال لاسلكي بالإنترنت لإرضاء أكثر الضيوف تطلباً. سواء كنت من محبي الرياضة أو كنت تتطلع لتفريغ عناء نهار صعب، ستجد خدمات ذات مستوى عالي بانتظارك كمثل حوض استحمام ساخن, مركز للياقة البدنية, ساونا, حمام سباحة خارجي, صيد السمك. إن كيرنز هاربر لايتس هو خيار ذكي بالنسبة للمسافرين إلى كيرنز، بما يوفره من إقامة هادئة ومرحة. Lovely view and very convenient location. The flat is very spacious. You got everything you need inside. Restaurants are just downstairs. If you are planning to go to Great Barrier Reef, the pier is just in a minute walk. I will definitely come back for the same hotel. This property advertises "Spectacular rooms ...amazing views", but that all depends on the room you get. We have stayed there before and had a great room with a good view. This time we were allocated a room on the 4th floor on the Southern side of the building. The room was tiny, and the view of the Hilton Hotel was great, but certainly not the view we had in mind. The bed was uncomfortable. The air conditioner continually switched itself off, and there was no wi-fi for the first few days. It is a great location though, close to bars, restaurants and casino. We stayed in a 1 bedroom appartment. The accommodation is close to the marina and casino. The rooms are well equipped and clean. Dundee's Restaurant at the bottom of the hotel and on the boardwalk do great lunch deals $17.95 mon-fri. Evening meal was really nice as well. We ate there 2 days in a row and the evening as well. Great position if you plan a cruise, as we did. You just need to walk out onto the pier from your accommodation. Lovely pool/spa area up top, with great views. Staff always very polite and helpful. Only negative, our room smelt damp. Was given spray but didn't really work. Overall great hotel and would stay there again. The hotel does not have a restaurant but advertises Dundee's in their lift. Parking is not included and costs $10 per 24 hour. Perfect location. At the harbour, walking distance to hop on Great Barrier Reef tours. Close to the city, and next to the esplanade. Price of hotel is quite expensive, but we understand that its peak season. Also, a tiny bit disappointed that we were trolling a baby along but got no help offer for our luggages. The location is great. The hotel area is quiet and convenience. Room is big with quite nice view even I just booked the basic type of room. Just the staff are not too friendly and a bit slow response. But overall that won't affect much. Probably would recommend to friends if they are going to cairns. Great motel, could not fault it . Dundee's restaurant on the boardwalk was a perfect place for romance with fantastic food and wine choices, we totally enjoyed our stay and recommend to any couple to stay and enjoy. Really good location for the excursions. Hotel staff were excellent and friendly. Very good a helping to arrange excursions too. Our apartment was clean and really comfortable queen sized bed. Excellent value for money. We had a one night stay at Harbour Lights. It was close enough to all restaurants and nightlife, as well as having a nice view and peaceful location. Room and bathroom were a pretty good size and staff were friendly. I went there with my family. We stayed in the other hotel for a few days and then moved to this hotel for the nice view as they shown on the picture. but I stayed in the room and the view was blocked with the trees. The location is amazing but It wasn't worth it to pay that much money. I think I booked a studio size room so it being small was ok but even though there was room for a couple of luggage racks there were none and the desk provided was so tiny and cheap looking. Also the outdoor furniture was cheap and nasty and daggy and old looking (not what I expected from Harbour Lights). After leaving the rather nice reception area we found the interior very utilitarian and sort of cheap looking like it was thrown together at minimal cost. Still, bed was comfy, room ok. Restaurant on site is awesomely good! Such a good location for doing tours from Marlin Marina, you can get off the boat and you're back in your room within 5 minutes.Gym and pool were good. Only strange thing was that the cleaning staff only seemed to come when you're in your room even though it's been empty all day. So we never got it cleaned as we were usually having a shower! 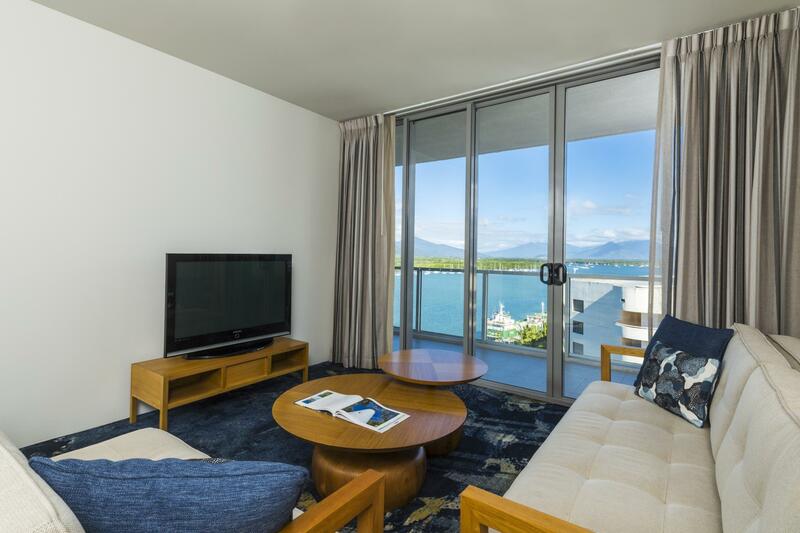 Simply put...Cairns Harbour Lights provided everythin you need for a four night getaway in Cairns! A fantastic location with great bedding, lovely view, all that is needed in the room/bathroom. Lovely attitude from all service staff. Terrific restaurnats within walking distance starting in the building and all along the Marina. Great value - we shall be back! 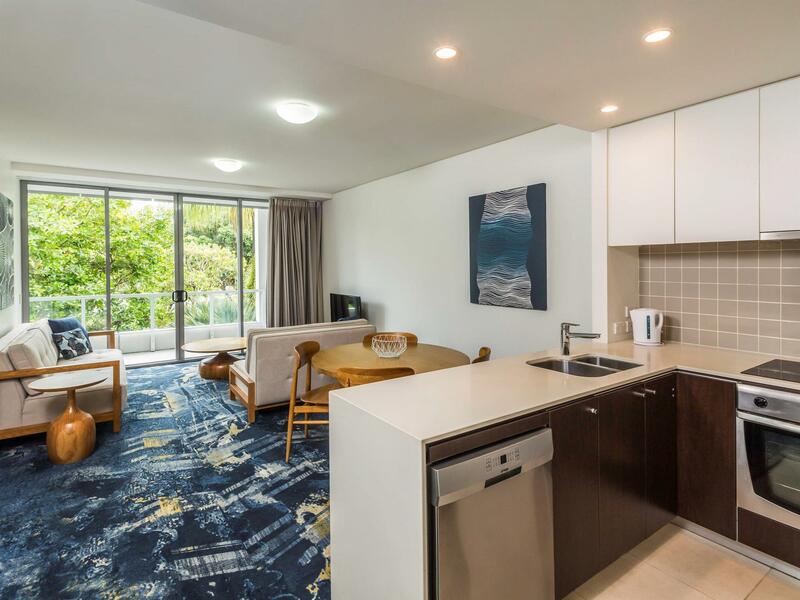 Our friends and I were in Cairns for a hen/stag weekend.Our friends had chosen other more & less expensive places to stay but I felt we did very well staying at Harbour Lights. Its great value for money with everything one would expect from a 4 star hotel. 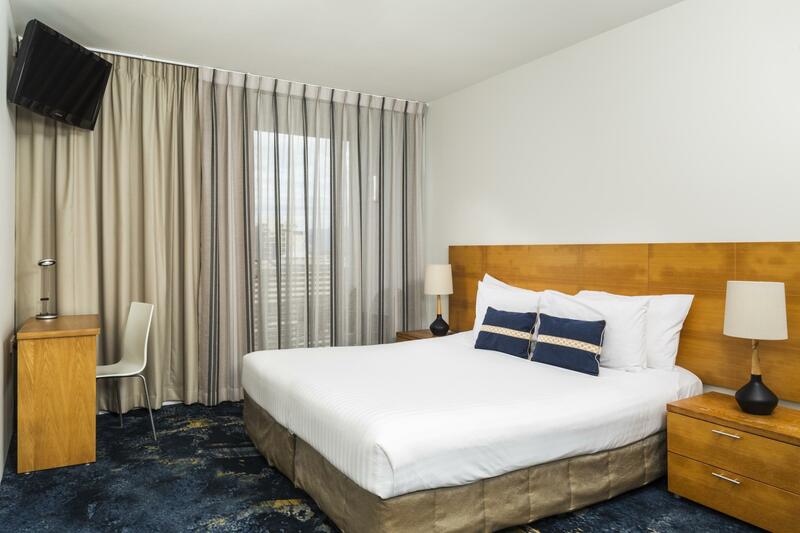 It's an extremely convenient location, our room was spotless, the staff were very helpful so I can't fault the place. My partner & I will definitely look it up the next time we come back to Cairns. 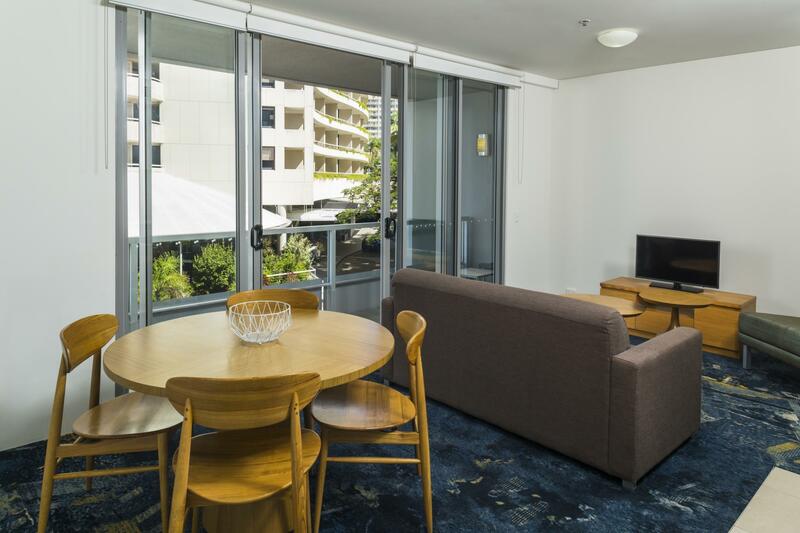 A perfectly situated place to experience Cairns, far North Queensland coast and country and the Great Barrier Reef. After a long wait to check into our room we were not disappointed by our spacious and well appointed apartment. Reception staff were friendly and helpful and the room was clean and well set out. Constant background noise I assume originated from the bathroom ventilation system and the air conditioning was quite noisy too although we didn't need to use this much due to mild temperature. A great escape from the winter chill and we would definitely stay there again. Our room did not get made up when we were there which was a little disappointing but otherwise it was a great hotel and lovely staff who were happy to assist at all time at the front counter downstairs. Clean and comfortable room,friendly staff,the best location and view. 1,The best location in the city. 2,Every room of the hotel can see the sea view. 3,Independent big lobby and profession front desk. 4,Very very nice staff. 5,Clean and comfortable room. We are appreciate that the front desk helped us book the one day,tour at 5:00a.m,just for make sure that we can join the one day,tour which we like.